Measuring 19 feet long, the Taxa Mantis Trailer comfortably sleeps 4 adults and weights under 3,000 pounds. Using NASA inspired design, the Taxa Mantis has integrated plumbing and electrical systems. The Cricket Trailer is 15 feet long, 1,450 pounds and can be towed by most 4-cylinder vehicles. With sleeping room for 2 adults and 2 children and NASA inspired plumbing and electrical systems, the Cricket trailer is perfect for an off-grid adventure. The Tigermoth trailer is a lightweight and rugged camper that is towable by most 4-cylinder vehicles. The Tigermoth camper has an entire built-in electrical system, LED lights, 12-volt outlets, and optional solar panels. The Boreas Trailer produced by Into The Wild Overland is an off-grid camping dream. Equipped with an independent suspension, oversized tires make any rough terrain accessible. The Boreas Camper sleeps two and has a 20-gallon water storage and 100 watts of solar power capacity. Intech Trailers are low weight and high quality aluminum frame trailers. Each Intech trailer has a slide out kitchenette with a stove and mini refridgerator unit. The Shasta Revere Camper Trailer comes fully equipped with anything an off-grid traveler will need. This luxurious camper has a spacious kitchen, with living space for a full family and a large-sized bathroom. Please give us a call at 303-322-6013 or enter your contact information below and a sales associate will be in touch shortly to address any questions you may have about the model you're interested in purchasing. 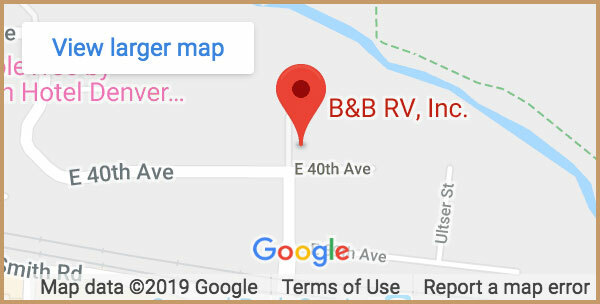 At B&B RV, Inc. we pride ourselves on providing the best RV and trailer solutions for our customers in the Denver, Colorado area.